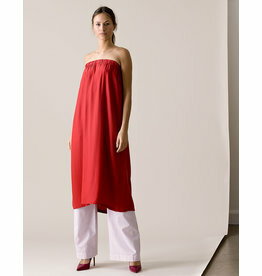 Very comfortable ankle long dress made from very soft viscose/cotton blend striped woven fabric with slit at the front. 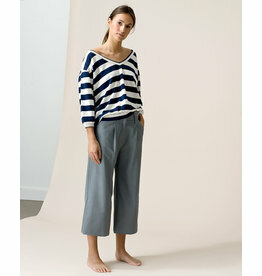 Side seam slit and pockets, round neckline, short sleeves and a self fabric belt, model wears a size 36. Comfy sweater with short sleeves with a pink cotton jersey , round neckline, raglan sleeves, cuff around the waist. Beautiful white embroidered cotton top with slit front and cap sleeves. Model wears a size 36. Very comfortable ankle long dress made from a beautiful white embroidered cotton, comes with an optional belt. 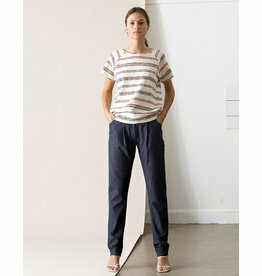 Side seam slit and pockets, round neckline with slit and short sleeves, model wears a size 36. Relaxed cotton shirt with red/white/blue stripes and a front pocket, with a mandarin collar with hidden button closure and long, rolled sleeves, box pleat at the back. model wears a size 36. Beautiful red silk top with slit front and cap sleeves. Model wears a size 36.